Regular followers of my Facebook page know that for a number of months now I’ve been soliciting a post on aging and age discrimination in academia. I’ve been seeking such a post because of the constant stream of requests I receive from readers to deal with this topic. I have not felt qualified to write about it directly, because although I am 47 now, my formal academic career path took place when I was much younger, and in terms of age, I followed a very standard “approved” trajectory: Ph.D. in early 30s, first tenure track job immediately following, tenure before 40, second, “better” job immediately following, foray into administration in early 40s. When you begin your scholarly career in your 20s or 30s, and pursue an active research and publishing trajectory with tenure, age discrimination, in many important ways, does not come into play for a very long time. In this, academia is different from other areas of the economy. That is not to say that older people, and older women in particular, are not judged, dismissed, or excluded in the academy as well, even when they have tenure. They absolutely are. Particularly in local, institutional politics, and the ranks of the administration, where men still predominate, and the upper ranks are absolutely filled with white-haired males, women are marginalized. Older female professors may well be relegated to the less-desirable teaching assignments, and ignored or dismissed in faculty meetings. No doubt. But, in our scholarly “fields,” we are defined as “productive” to the extent that we research and publish, and research and publishing are generally judged on merit of the work, without a great deal of attention to the age of the person publishing. Age matters if the work itself is perceived as being old fashioned or out of date, but advancing age is not in and of itself the cause of old fashioned or out of date work. An aging professor who maintains a lively and dynamic research trajectory is likely to enjoy a relatively stable reputation in his or her field for many decades. Because of this, the tenured professor is to some degree protected from the virulent age discrimination that affects workers in other industries. But for those who are just finishing their Ph.D.s or who are struggling on the job market, or enduring year after year of adjuncting, at an age beyond the “approved” trajectory, ageism and the pressures of age are real and urgent indeed. While I am very interested in the stories from the tenure track and tenured about the role of age and agism in their careers, I am more concerned about the fate of the untenured and non-tenure-track. My work as The Professor has revealed to me the exponentially higher stakes for them of the failures of Ph.D. programs to adequately and responsibly advise Ph.D. students to understand the job market and lay the groundwork for actual paying work. The fact is, finishing a Ph.D. and realizing that your graduate program has completely failed you in terms of job preparation is one thing when you are 30, and something entirely different when you are 50. I see this truth every day in my work. It is stark, and painful. Far, far too many older students, women in particular, make their way into Ph.D. programs later in life, finish in their late 40s and 50s, and are now, because of the disintegration of the academic job market, staring down the barrel of unemployment, massive lost wages, sunk costs, and devastating debt, all against the backdrop of looming old age. My former student is absolutely correct—discrimination against older women is all about patriarchy. But that doesn’t mean it doesn’t exist. 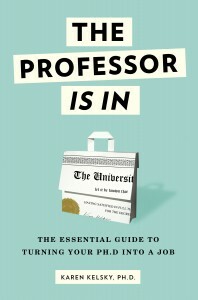 As faithful readers know, The Professor Is In is dedicated to exposing the brutal truths of the academy to empower its most vulnerable inhabitants, and does not engage in wishful thinking about what could or should be better. And I want to know just how this works. What happens to older people, particularly older women (however you define older), in graduate school, off the tenure track, on the job market? We need to know. Here is the one thing I do know, with a great deal of certainty: academia is a kind of cult, or cult-like environment. It is a closed and insular system with massive barriers to entry. The Ph.D. process is the indoctrination process that over many years inculcates practitioners into the correct values and norms of the closed group. The end product is successful to the extent that they have thoroughly accepted these values and norms, and made them into their own operating principles. What I have observed in my work with clients is that older students are more resistant to the indoctrination process than younger students. Their identities are more fully formed, and they have more years of previous values and habits that have to be displaced to make room for the new ones. The process of indoctrination of older students is more likely to be incomplete and tentative. And that has serious consequences for the older Ph.D. as end product of the system. What I have found in my work with older Ph.D.s is that, despite their equal length of time in their programs, they frequently miss the core elements of indoctrination that are absorbed by their younger colleagues. With a depressing regularity, my older clients seem to leave their Ph.D.s with a significant deficit of knowledge about the unspoken norms, judgments, practices, and status operations of the academic environment. Older clients, at a much greater rate than younger ones, miss the messages about attending the highest status program possible, networking intensively at conferences, publishing while still in graduate school, and competing for jobs at the highest, ‘Olympic” level of intensity. Some of this is undoubtedly logistical—older students with children, for example, will not be as free to attend the after hour talks, the happy hours at the bar, the conferences, and so on, where much of the socialization of Ph.D.s takes place. Some of this is, for lack of a better word, attitudinal—older students may be coming from successful previous careers, and are perhaps more skeptical of the status hierarchy embedded and manifested in all Ph.D. training environments. Some of it may be longitudinal–many of my older clients tell me that they viewed academia as a step AWAY from the “rat race” of a stressful career, not realizing that its requirements are just as intense and stressful. Many mid-life Ph.D.s imagine the arts or humanities Ph.D. as a grand Oprah-esque adventure in self-actualization and liberation, not understanding that it is actually an exercise in conformity as rigid as any corporate environment. And some of it may be physiological. I know, as a 47-year-old starting a new business, that I had nothing like the ferocious, unstoppable energy that I had in my 20s starting out in the academic profession. Back then I could live on no sleep, and no expenditure of energy was too great. Not so now. I have to ration my energy now, and use it carefully. But the productivity level required of the tenure-track job search is not compatible with any kind of slowing down. I realize that these observations may appear to be a case of ‘blaming the victim,’ as if I’m saying that older Ph.D.s are somehow less deserving of positions because of their different path through graduate school experience. That is not what I’m saying. What I see are a constellation of circumstances whose end result is that the distintegrating job market and indifferent and inadequate Ph.D. training apparatus, which are destructive for all, are particularly destructive for older Ph.D.s. Because, the fact is, the margin for deviation from the norm, and for ‘variation’ of any kind, is evaporating. Just as the college degree is increasingly returning to the exclusive privilege of the wealthy, so the academic career is increasingly becoming the exclusive province of the young and strong. And that is to its ultimate detriment. I was talking with a female professor of mine recently about her frustration as a working mother in academia. A male colleague had recently left a staff meeting early to pick up his kids at work; she was annoyed that when he did so, he was lauded for being such a good father, whereas whenever she has had to work around her schedule as a parent, she feels that she is judged about whether her priorities are correct. Double standard, right? But we got to talking about the larger implications of this standard — why is it that fatherhood is such an acceptable conversation, but motherhood seems still taboo? My only stab at an answer is and was that when we talk about maternity, motherhood, etc., we’re bringing into discourse the female body in a way that troubles us. When we talk about fatherhood, we’re not talking about bodies but instead about actions, activities, emotions; when we’re talking about motherhood, we’re talking about vaginas and breasts and blood and all those other abject things. So. I don’t know if this is a useful addition to the conversation about age, but it’s what I’ve been thinking about in my little slice of academia in terms of how we treat bodies and which bodies we decide matter. Totally relevant, and I completely agree. The “messiness” of women’s bodies has made it in as a proper object of study, but it’s still profoundly uncomfortable as a lived reality in the room. Your other point, about how many different kinds of people fall outside the “authorized” identity, is so true. For example, a number of people have messaged and emailed to talk about the difficulty of being too *young* as a Ph.D. and thus dismissed. That will never equal being too old, of course, because with youth comes years of chances to change course and make up for past mistakes. The forclosure of options is what’s so frightening about being an unemployed Ph.D. at 50. But the larger point is that the path of “success” gets narrower and narrower and less and less forgiving, with each passing year right now. Precisely. And as a young, very femme woman, I know that I’ve had my fair share of negative comments from professors — female professors, in particular — about the way I present my femininity. Comments like “you’re young and pretty, so stop painting your nails, because it will make people think you’re not serious enough” are part and parcel of the kind of ageism and misogyny that we’re both talking about. Oy! This post really highlights how broken academia is. In my field of literary studies, eminent critics have built their careers on the intellectual argument that some forms of literature inculcate readers into the correct values and norms of a dominant ideology. And yet the very system which these critics themselves enforce rewards only those young scholars who have accepted the conventional values and norms. It doesn’t take an older student to see the hypocrisy in this. It only takes an honest one. As a non-traditional, “mature” student working on a PhD, I’ve spent most of my graduate school time thinking about the options and challenges and problems ahead, in terms of employment. But in some ways, I’ve realized my age and experience outside of academia has been an advantage — I think I am the only one in my program who has spent time (in medias res, so to speak), thinking, preparing, making and keeping contacts, reviewing job announcements from multiple sources, inside and outside of academia, etc. ), in addition to the academic work. All that thinking, daydreaming, and preparing, in fact, is how I found Karen. My younger friends are modeling themselves on the only career tracks they are hearing about (i.e., the traditional academic route), and many of my younger friends who have finished up have been devasted to find their one option closed off to them, or always deferred, around the corner, and don’t know what to do. I’m not sure what the future holds for me, but I will share one thing that I found both inspiring and empowering. I had dinner one night after an academic conference with a woman from Australia who was doing her PhD down under. We were sharing stories over drinks, and she said “I’m used to making my own way in the world.” It stuck with me, because it was shorthand for what I was finding it hard to convince my younger friends to take onboard: stop expecting the faculty or “the system” to work as planned. I know this isn’t a solution to the patriarchy and ageism and misogyny and an economic system that exploits workers and exploits our democracy (privatizing profit and socializing expense/risk) and all the inequities in this world . . . but when I find myself feeling victimized, I remind myself that I’m used to making my own way in this world, and that thought not only makes me feel more confident, it reminds me to build into my schedule and systems a way of always looking for options, for clarifying what is most important to me, and ways I might be able to put myself in a position to spend my remaining time in this world on those things. Just passing on my Aussie friend’s comment in case it is of practical use to someone else! I’d love to hear the perspective of hiring committee members: Do you balk at hiring older candidates because of possible (real or imagined) age-related diminution of energy? When faced with the prospect of hiring an older woman, would you consider the fact that she is likely beyond the point of having (more) children to be a positive factor? Do you consider “outside experience” to be an asset in teaching and mentoring students? First, @ kg. You don’t need to put dates on your cv. There’s no reason for the search committee to know when you got your bachelors, for example. I had to be told that. The first interview I got happened to be at the first institution that received my date-less cv. Karen, for a “traditional” academic, your assessment is astute: “staring down the barrel of unemployment… against the backdrop of old age,” check, check, check, check, and check. Cult… check; resistance… check. I was naive. I didn’t know academia was a cult. I found out very quickly that it is a cult and that my resistance to indoctrination (even before I realized that as the nature of my discomfort) made me a problematic figure in my department. Incidentally, the late-indoctrinated are much less likely to be effective indoctrinators. We’re more likely to question the paradigms of our fields before carrying the department banner… into the undergrad classroom, for example. My field is young and my doctoral program is young. I see the faculty performing strategic, collective mind-bends in order to justify their own existence. (OK… I’ll just say it: film studies). All I wanted to do was teach critical thinking. Indoctrination is antithetical to critical thinking. Right now I can see myself as possibly being an academic advisor. So I guess I should have gotten an education degree. As it is, the advisor path could work. I’m lucky that I don’t have as much debt as some (I avoided the masters money hole). So, yeah. It’s bad. And I haven’t even spoken to the question of discrimination. About that, I have to say that I don’t really know. I would imagine its rampant. And maybe for “good” reason. As Assistant Professors, we’re likely to be “difficult.” Right now I’m feeling pretty damn difficult. And in this job market, they don’t need to gamble on me. How did the search committee respond when they finally met you? Did you get a job with a CV that had no dates to indicate when you were awarded your degree? I have often been told to leave dates off, but I have not found it to be an effective strategy so I stopped doing it. These days, most schools ask for copies of transcripts, which have dates on them, and/or have online application forms which ask for dates. So, even if someone leaves dates off the CV, the committee has plenty of other ways of finding out that a candidate is older. I’m ABD and, no, I haven’t gotten a job––or a post-doc––with a dateless cv. (Because I’m ABD, my PhD will indeed have a date: 2012). I felt good about the interview I managed to get (this wasn’t a film dept. btw… I would have been an interdisciplinary hire) and I don’t think my age cost me the job. They hired someone who has a few years on me academically (she’s already an assistant prof… I don’t know her age). I actually do have good reason to believe that the scholar they hired really was the more logical “fit” for this department’s needs. I really liked the program I interviewed with; I don’t consider them typical, though, so it’s hard to extrapolate from there. So, I guess I’ll just say that, so far, leaving the date of my 1980s BA seems to have been a good plan. Nevertheless, I’m staring down the barrel of unemployment. Dear N.o.t.–this is a great set of responses, thank you. It’s indeed very strange that some of the newest and youngest and hippest parts of the academy are the most cult-like. it’s weird. it has something to do with an obeisance to ‘theory’ and making an already insular and closed environment even more insular and closed by virtue of an authorized jargon/language. And then there is the futility of fields that set out as a core mission to be “critical.” In the end critique is a negative. It does not build, it only chips away. A strong and inclusive community cannot come from that. You bring up a whole other can of worms. I wouldn’t say my that field, in general (based on my particular departmental experience), suffers from obeisance to theory. But I know what you mean. There’s a split. There is, on the one hand, a reliance on an era of theory that we tend to teach outside of the historical context of its production… which means that it makes little sense to undergrads and yet we expect them to accept its value, on its face, as “The Theory.” Then, on the other hand, there’s the tendency to give the kids what they want… which is an ill-conceived, unconceptualized “study” of popular culture. I tend to balk on both counts. My gripes are probably field-specific. Film Studies left the English departments. And that means we had to find out own undergraduate market. That undergrad market is supplied (generously) by kids that want to make movies. So we pretend that film “studies” will make our students “better” cultural producers. But what is “better”? What our students see as success is defined by the marketplace… the industry… Hollywood. Undergraduate demand for film programs (i.e. production programs) is what made my field a “growing” one is 2005-7. Now it’s all an ill-conceived mess. The kids want digital media production. Academia wants to dress that up as digital media “studies”… whatever that is (and, believe me, they don’t know what that is), just as they used “film studies” to put the intellectual gloss on their production programs. What I see is humanities oriented film scholars operating on the backs of actual practitioners… scholars intellectually jockying to justify the relevance of their knowledge (the lucky ones are well paid to do so). It’s sad and weird and I’m increasingly cynical. We are hard pressed, these days, to be teaching “media studies.” The best of that practice still happens in the Communications departments. Aside from the age issue (I’m 36 and planning to graduate a year from now), can we talk about this: “But the productivity level required of the tenure-track job search is not compatible with any kind of slowing down.”??? Because, for me, balance is really important….crucial actually. I think it might be a function of my age, but I just know that I don’t want to live my life all revolving around work, even if I’m passionate about my work. Yet, balance (meaning I mostly don’t work at night or on weekends, so that I can, you know, be with friends and family, garden, exercise, relax and think) seems to be something I’m not allowed to admit to in this macho workaholic culture. The dilemma I face now is, given the importance of balance to me, should I forgo even thinking about looking for an academic position at the end of this? Or should I be looking at industry/government? (luckily I’m in a field with not only many tenure track openings but also opportunities in other arenas). And if I do go the non-academic route, do I even let my advisor know??? I came across this site, very good but somewhat disheartening. As a former PhD student who quit, now a Masters by Coursework with a Dissertation, I do agree with a lot of what is written. However, I cannot agree with the waste of time getting a Phd is at a late age. I would do it again. But I know academia is not for me as I do not follow rules and I do not agree with the concept which I noticed was, even if you do 100% what everyone wants and lose yourself in the process, it still does not please them. Even my PhD Supervisor left academia. But as I said, I would do it again only knowing that the entire process would be better as skills for future employment somewhere. One might say it could be a flight of fancy to do this. My point is, yes it would be viewed as ‘crazy’ to go back and do the PhD again but I want to, but at this age, late forties, I won’t get into a position there. Age might have something to do with it, but I would say I could not fit into the culture. Problem is, although different, I may have to do this in a boring corporate office job; politics, looks, age and sucking up are there too. My main reason for leaving was at the time I just realised after 4 years anything I wrote would not be good enough. Also I don’t want to move overseas even though, with shrinking opportunties for everyone, the job market in the UK and USA is slightly better, but so are slightly more open minds towards research. Yes I will try again to get a PhD, yes I know it may be something simply as a fancy of a thing to do, yes I know it will be challenging and backside kissing. But at the end, it is something I want to do again as I really want to. My final thought is, unrealistic but, maybe the PhD is something that should be viewed not just as a contribution to knowledge but also as something that gains one useful skills (it is possible bare with me) in order to get work. To assume it is simple just an instrument of the academy is perhaps outdated. The baggage of the PhD can be off loaded. As I said unrealstic and perhaps I am being a dreamer, but surely it is a degree above anything else which comes with skills that don’t have to just reside in an academy. Society, perhaps, needs to let go and utilize those that choose to work in a non-academic setting with their skills to reason, research and above all contribute. As I said, pie in the sky but not beyond reason. Actually, during both on-campus interviews I had this season (at teaching focused universities), various members of the search committee and faculty mentioned in conversation specifically that they were looking for someone “young and energetic” for the department. It wasn’t one of items on their “official” list of requirements. However, from the dropped comments, it was obvious that both “youth” and “energy” were things they wanted. Of course, that probably doesn’t mean someone would be automatically sunk if they weren’t young…perhaps an abundance of energy would make up for it? But I believe it’d definitely be a strike against them. doesn’t surprise me in the least, Penny. And yet I very much doubt they’re after that energetic enfant terrible. Someone “cheerfully naive” is likely to make for the more successful candidate. None of this should come as a shock. This is great insight, Penny. I myself probably used that exact line many times on searches. It’s ageism pure and simple. But unrecognized. Iam almost 52 years. I have be accepted into a doctoral program. I wanted o do this earlier but circumstances did not allow. Do you think this is a good idea. The program starts in early August, 2015. Read my blog post, Should I Go to Graduate School? Its answer for a situation such as you describe: no. I am curious about your final decision. I’m 41 years old am I was planning to go for a PhD in Ed Paychology. Now I feel I shouldn’t. K: Did we lose some of the comments on this topic? uh oh….i think we did. that’s never happened before. where did they go? Two comments that were lost were a question to me as to whether I advise leaving the BA date off, and my response. Short answer: I am completely divided. The first time I saw it I freaked out and accused the poor client of being unprofessional. She explained the reasoning, and I realized, ‘oh of course, that makes sense.’ Now when clients do it, I don’t exaclty object, but at the same time, only people over 40 do this—so does it really help? My feel in the end is that it’s a sin of omission, and it’s a bit of a falsehood. As the initial comment remarked, it’s like using an old photo of yourself on a dating site. And when they meet the “real” you, they’re shocked and offended. I thinnk the risks of that exist. My general, but not dogmatic view: leave the date on. I responded to n.o.t. that I would not leave the dates off of my CV, but now I’m too lazy to rewrite the reasons why. 😉 –And now it looks like there’s a 5-yr plan to write. thanks, kg! at least the record is there. I think there was also some discussion of crowd-sourcing the question of how the ethos of the CV is affected by leaving dates off. I would love to read some real-life experiences and reactions from search committee members, job applicants and so forth. ok, i’m going to put it out there. Speaking of aging, slightly larger print here would be terrific! ha! that’s the stupid default font of my theme. I can make it bigger though. I am no longer in academia, but served on two search committees for tenure-track positions during the time I was. This was in the social sciences/humanities. 1) Leaving graduation dates off of your cv will backfire. Your cv will be redflagged. Committee members aren’t stupid. They know why candidates do this: they are, as Karen said, over 40. 2) If you start tinkering with the format of a cv, the committee might start wondering how else you are trying to game the system. 3) Committees prefer to hire within the “acceptable” age range for junior faculty. 4) Search committees are incredibly conservative in terms of what they will consider an acceptable career trajectory. This means: fresh out of graduate school, peer-reviewed publications, a small teaching portfolio (just enough to convince the committee that hiring a new candidate won’t mean calls from the Dean’s office every 10 minutes), etc. 5) Gaps in the cv are seen as indicative of a major flaw in the candidate. 6) With few exceptions, “practical work experience” counts for absolutely nothing in the humanities and social sciences. 7) Adjuncting counts for nothing (and more often than not is a mark against you). 8) A search committee won’t be interested in any explanations a candidate might offer for his or her specific circumstance. There is no time to read long-winded explanations. 9) Here is another problem: Let’s say I’m looking at the cv of a 50 year old who is applying for an entry level tenure-track position (and just to do away with another pipe dream: no, you won’t get hired at the advanced level): I won’t compare this candidate to the other candidates in the pool, I am going to compare him to what I think a 50 year old academic should have accomplished by now. And make no mistake: It’s easy to figure out how old a candidate is. Based on my experience, I would say this: if you simply started out late but have a degree that is reasonably current (within the last 2-3 years, after that your chances at making a short list drop dramatically) and you have a competitive portfolio, you still have a chance. On the other hand, if you’re 50 years old, and you’ve spent the last 10 years shuttling between adjuncting positions, have the bare minimum of publications, etc., your chances are 0. The pool is simply to competitive, and you will not be able to “break through”. For what type of institution did you work? R1 university? SLAC? Ivy? Something else? And where was the school–east coast, west coast, mid-U.S.? Those types of demographics would helpful. I observed a similar dynamic at both places, in both cases it was clear that the search committee wanted someone “young and dynamic” (committees use various euphemisms to convey that message). Even at the SLAC teaching was an important factor, but research potential was a much more significant factor in terms of evaluating candidates. Both schools eliminated their VAPs early in the search. In the end, both schools hired cookie-cutter candidates (Neither candidate was particularly brilliant, or said something particularly memorable – both their scholarship and teaching portfolio was strictly middle of the road stuff). Richard, Thank you for posting this information. I know in the past that women who took “off-ramps” from an academic career trajectory could sometimes re-enter at a later point, but now it appears that this path is becoming more difficult. A casual discussion with a prominent professor in my field recently confirmed that hiring of non-traditional applicants is tightening up. I received my terminal degree at 37. The recent graduate degree made me younger in the eyes of the committees. I found that people tended not to notice the BFA/BA date. It really was not a problem and when I got hired for contract work they took my before grad school experience into account and I got paid far better than my younger counterparts as a result. Unfortunately, for other reasons, I did not charm a tenure line search committee during those years. Fifteen years later at almost 51, I literally have a degree from the last century. I have been productive in my career, but not distinguished. I think the committees no longer see me as a might be, but as a never was because the application packets that used to get me 10 interviews now get me 1 if I’m lucky. As I understand it from colleagues, the committees are very aware of how many productive years a candidate will put in before retirement. They may potentially get 30 years from a gifted young hotshot that they see as having unlimited possibilities at the beginning of their careers. People like myself, however, are seen as limited in potential and a drain on the retirement fund within 15 years. I know that I am passed over often as a result. Ageism yes, but I can’t help but admit that the rationale behind it does make sense. I am afraid that hair coloring and adopting a good fitness routine is all one can do about it. I began my PhD when I was 26. A marriage, two children, and four years’ as an instructor later, I graduated at 38. I did not look for full-time academic work until I was 47. I adjuncted voluntarily, when I could not work full-time, for eight years. Then I adjuncted full-time for part-time pay while looking for a ft/ft job. I have found two full-time positions in the last two years. Both great for different reasons. It is not impossible. However, you have to be interested in/willing to teach a lot (those 5/5/2 and 6/6/1 years showed that I was) AND you have to do conferences and publish like crazy. It was the publishing that got me the first ft job. It was the publishing and conferences and technology focus that got me the second. Were you able to find a tenure-track position in your field? I really wish someone had told me how hard it would be to break into the academic world. There I was – in my 50’s and damn proud I survived the doctoral program and with a boatload of job experience in “the real world” behind me. Years of adjuncting with the promise of full-time employment if I was loyal to the school never paid off. In fact, a large rural state university in western PA with a well-known reputation for ageism in its Geography Department actually used me to take up the teaching load for another female professor of color who they denied tenure and wanted to banish. Because I needed the job and thought they would look kindly on me, I taught her classes and gave them the opportunity to buy-out her contract and push her out. I should have known that I would not even be considered for the position she vacated. In fact, I was not even given an interview! I should have known this would be the outcome, though. All along, I was asked questions about my age and told I should open a bakery shop, etc. and other equally disgusting comments during my teaching experience there. The department chair, who often ran out of gas on the interstate on his way to classes, even told me that all he wanted in the next hire was someone he could drink a beer with. This is not what I envisioned the hallowed halls of academe would resonate with. Anyway, am I sorry I obtained my Ph.D.? Heck no! I am damned proud of it if it never earns me another dime! Was I used, abused, manipulated, taken advantage of, and misled ? Damn straight! In my opinion, if you are planning to obtain your terminal degree, go straight there, do not pass “go”, do not tarry! There IS no career path for most of us who bought the bill of goods that we could actually get a paying job with our Ph.D. after 50. We just invested the best years of our lives and a lot of doh-reh-me to chase an elusive dream. I am sorry if I sound bitter. I am. Sorry to hear this, Corinne. You got the double whammy— not just adjuncting, but then the inside candidate curse. Damn, that is heartbreaking to hear for current PhD students. It also speaks to the quality of universities today. Loyalty is only a one-way street in the world of work (and that goes for any field). But I’m glad you don’t regret going for the degree. I must admit that I will be able to tolerate this particular topic of discussion only in short doses, because it is far too painful. But thank you for raising it all the same. I was a “non-traditional” Ph.D. student who returned to school in my mid-30s, hoping for a fast track out. However, since I was completely, almost criminally naive about the realities of the academic community at that juncture, I did not make good and strategic choices while a graduate student. (I could probably be a case study of what not to do, so I will likely not read the sections of your site that give advice to grad students!) I finally dragged myself and my dissertation across the line when I was in my late 40s, totally exhausted by the experience and regretting all the sunk costs, squandered opportunities, enormous debt, etc. etc. Actually, about 5-6 years into the ordeal, I realized that I was not in a promising situation, but I had no idea how to get myself out of it and into something better. That’s not the fault of academia, I do admit. By that time, I was also a single parent for the second time, and that set of life decisions also compromised my chances for success as an academic. I thought I had managed a creative solution to my predicament by getting involved in higher education union activism post-defense. Unfortunately again for me, that career path was interrupted when I became seriously ill last year. At this point, I am disabled, collecting SSDI (a much smaller benefit than it might have been had I been more gainfully employed over the years), and fighting to regain my health. In any case, I am well out of the academic realm and never likely to return. However. I have recently remarried as well, and my husband is–surprise!–an adjunct. He’s in a field that’s relatively well-paid, but it is far from enough to suffice to support a family, particularly now when we have to pay for our own health insurance as well as my medical expenses. And he’s no longer a young person either. So despite his excellent qualifications, stellar teaching evaluations, and prolific publication record with original and groundbreaking work, I doubt very much that he will ever have a good shot at a TT position. I’m not simply being a loyal wife here; it’s not only on account of my own experience, or my husband’s, that I am so disgusted with the state of higher education in the U.S. It’s because hundreds of thousands of highly skilled people (at various ages) are being exploited and used, to serve no good purpose whatsoever. We, too, are part of the 99%. And I hope that there will come to be not only awareness but activism among all the ranks of the professoriate–because eventually we are all going to rise, or fall, together. I often thought the same thing and expressed as much on public academic forums. I believe that the ‘army of undergraduate hopefuls’ in programs (mine was anthropology) are what funds and floats academic positions and graduate schools. I’m fine with that but I think academia needs to be readjusted to what the real hiring expectations are in the “real world”. To cut to the chase, departments need to start being selective about how many undergraduate majors they can take and nurture through to employment. Is being sold false hopes as an undergraduate to keep you and grow the program what you meant by exploited? It’s how I felt — cannon fodder so that the chosen promising few can have a program to ride on and make it to the meritocratic top. I did my phd in my 50s. Grad school was a wonderful experience, I had funding, I completed my doctorate within five years and turned my dissertation into a book at a top press. I was never conscious of my age or had anybody question why I was going back to school so late in life. But adjunct teaching has been terrible, the lack of respect, exclusion from any planning, a refusal by faculty to discuss joint research, junior faculty who won’t even speak to me. I’m glad I went back to school, it was a wonderful experience, but I’m trying to find funding so I can write my next book and escape the soul-killing world of adjunct teaching. It has been completely demoralizing and the only thing that is making me able to read these painful posts is the realization that I’m not alone. I would like to share my experience. I returned to my hometown to do my Phd. Within 6 months my first supervisor told me I would never find a job (I was 43yrs at the time). I ignored this and carried on attending seminars etc. He used to deter me fro attending seminars by puffing out his chest at me and intimidating me when I attended. One day out of the blue he said to me that I had not done enough work. I found this strange as I had been working assiduously on a daily basis completing the required work. He informed me I had towritesomething for a meeting in two days time on a topic not exactly in my then current research area. I had to submit this to him for thie meeting. When I arrived for the meeting I was told it was to bean open door meeting. He took out my submission and proceeded to tell me I was rubbish at the top of his voice for about an hour. This was all within the hearing of the whole department. I was astonished and although I maintained my composure Some part of me was destroyed. I asked him if he would consider not being my supervisor. He said no however I went to the faculty head and changed supervisor . This was a heinous crime it seems – I had no friends for the remainder of my candidature and was marginalised and alienated at every opportunity. It took me ten years to complete my PhD and so have been conferred at the age of 53. During this time I tried the part time study with work combination for some time and met with allusions to the incident with the first supervisor which after a couple of jobs seemed to establish my destroyed reputation. I fell pregnant during an academic job (my last job) and although I was already being bullied at this job it reached inhumane proportions as it escalated during my pregnancy. I left the job of course. My conclusion is that the world of work is an inhumane and sterile place. Academia is no more intelligent in terms of workplace relations. Women risk their most precious assets by participating in such an environment and system. I believe that the economic system is to blame. The values that would produce a humane and fertile environment do not exist in economic thinking and so do not exist in the workplace. We have to create something better than this. Just thought I’d chip in – I was 52 when I graduated with a Ph. D. and terrified of being excluded from any kind of faculty position. In reality, I interviewed on the phone, had repeat interviews, went for campus visits, and had a choice of 3 offers. Of course, I was willing to relocate just about anywhere in the US! I moved to Texas opting for a public instruction over private ones. Yes, my CV has dates – undergraduate 1971-75; Master’s 1975-77 and Ph. D 2009. The off thing is, my interviews did not smack of any kind of discrimination; the using, abusing, manipulating, taken advantage of, misled happened after I joined as tenure-track faculty. I plunged right into the heaviest course load in the department, several publications including a book, two research projects, and served on numerous committees. Just when I thought I had found my “place” in the academic world, I was reminded in several subtle as well as blatant ways that I was an “older” person, living away from my husband (so something must be professionally wrong with me if not personally), as a colored woman I was “only” fit to teach sociocultural foundations as curriculum theory “needs a good instructor as it is a required course”…..the list of discriminatory comments grows longer each day. So here I am, headed for another tenure track position, this time on the east coast, a lot wiser , calmer, a little sadder, and still in love with being a professor! So this message is long after the last post but perhaps someone will see it…I took some ‘time off’ = ‘figuring out what I wanted to do’ for 6 years during which I worked full time and took classes related to my discipline. Once I entered the grad student world I have been ‘reasonably successful’ in publications and teaching assistantships. I will graduate this summer at 37 with my PhD. I can’t tell from the discussions above if I’m screwed…anyone willing to be honest? I’m in the sciences and want eventually to obtain a tt job at a PUI. You’re not screwed. 37 is not old in Ph.D.-land. Thank you. Seriously. The main theme of your blog – honesty – is the one thing I relish the most right now and find 100% lacking in the folks I tend to seek advice from. 1) How do you say that elegantly without making a fool of yourself? 2) I worry that it will draw folks away from all the awesome work that I’ve done and will do. My gut says that as long as I’ve got the dates on the CV, let the application materials do their *magic* and be prepared with a good answer if I got an interview…. I completed my PhD in a humanities discipline in 2012 at age 53. I went back to graduate school with my eyes wide open, knowing that my age would work against me. I continued to work full-time in the “real world” and do grad school full-time thru my MA and first year of PhD; I began teaching full-time (as what we call sessional here in Canada; similar to adjunct) in 4th yr of PhD. (BTW, I am male, married, with mid-school age family, and am in Canada; it took me 6 years to complete my PhD.) I spent 20-some years on a managerial careerist path in multinational corporations and have no illusions that the “real world” is a career utopia– indeed I was both victim and agent of more than one downsizing in my time: the fact is, anybody over 50 is vulnerable in any job. I consider my lucky — I have a long-term sessional contract at an institution that, due to its unique nature, provides a decent salary and benefits. Now that the diss is done, I have decided to test the permanent market, but on my own terms. I am not naive enough to think ageism won’t apply to me — folks seem to prefer hothouse flowers to late-bloomers; but (to mix metaphors) I also believe that if you can compete at the Olympic level, your age counts for less. I’m not sure if I’ll get a TT position — but I’m damn sure I’ll keep publishing (creative and academic), teaching, and learning at the highest level I can. I know many of my peers (I am reluctant to turn them into competitors) have youth and energy — but I am not without energy; and I get stuff done. Whether I convince hiring committees remains to be seen. Is it too late to join this conversation? I found this site in early 2012 (at least) and what I read stuck with me in a profound way. Since then my own feelings of doom have been profound and I am seriously wondering if I have been fooling myself in thinking that I have a chance given that I will finish my Masters in my early 40s. That would mean on conservative estimates that I would finish a PhD at 47-49. I am not pandering for a pity party here — I present my demo information here and next, as what I consider to be objective fact. I am a white male of non-traditional graduate student age who is showing some age now and a few extra pounds. There is little incentive to I can offer anyone unless my research knocks it out of the park, but that has proven difficult because to do research you have to get connected and honestly I feel like every faculty member I have approached in the last year has been luke warm to my approach at best. This could be the result of my questions or people skills, but I also feel that in some cases I have seen visceral reactions when someone first sees me in person. But from what I have observed, getting connected and mentored is the key to success and I have had no luck in finding anyone to mentor me in a lab setting so I am mostly doing it myself by reading and taking extra classes. I am also looking at getting back down to the 32″ waist I was 4 years ago and getting some cosmetic work done not for vanity but for what I consider to be a smart investment in my future if I am to have one. New clothes and style will help too. In my late 30s I was doing more to appear younger and never revealed anything about my age at school. Cosmetically I didn’t need to do much because I looked younger than my age (most estimated 30 on average) but I would use concealer for under eye circles and sometimes color my hair to make it shinier and rich. My hair was copperish blonde growing up – and is fading with age, yet it is not full on gray just yet. My weight and tone was good too, but that faded in the past few years with more time doing desk work and less doing manual work. When my age was not immediately in question or assessable, it seemed that more doors seemed to be open. But that changed when resumes and talks of experience began to reveal my not so glorious and circuitous past. You can’t hide time on paper trails, but at least my second bachelors is only a year off from when I began my Masters work. Now that I have messed up and let myself go a little, I am noticing more the slightly shocked looks are easy to spot – in one case it seemed as if the person were in disbelief. It was one thing to be in a second undergraduate program in my 30s but I thought that in graduate school, age mattered less. I was sorely mistaken. I and we know that age matters, but it really stings when you express anxiety to cohorts or professors and they brush it off as nothing to worry about or don’t comment at all. Again, it must be mentioned as I did above, that maybe much of this is vibe and appearance — what messages are we sending? Maybe I seemed desperate (I am and worried too) and tired and old and that put people off. We have to rule out all factors before claiming ageism I think, just to be sure we are accurate in our assessment. The Professor Is In Blog’ posts on ageism, and many others I have read on the Internets shocked me into a rude awakening. I got worried, stressed, angry and then soberly adjusted to the fact that I had to do something to secure a future, so got to work a serious non-nonsense Plan B. My new Masters degree is in health related program area that is in hiring demand to some extent, though that too is dropping bit by bit each year and I still have a year to finish that one and my first Masters. But it offer more possibilities and I feel satisfied with it. Still, the PhD is an idol, an obsession I guess that I can’t rationally justify and I still want it. Maybe one reason I feel I need the research PhD is that I fear that unless I have it, no one will ever consider letting me publish and my research otherwise won’t be taken seriously. Despite that ‘want’, it is far less important for me now to have a professorship job than it was a year ago. My best hope is that my Plan B will allow me to make enough money to support family, support side research endeavors and put some resources towards preparing my son for a research biology career if that is still his interest in 9 years. I only hope that it is his interest (and in his best interest) and not my attempt to live vicariously through him. I have much more to add here but I am ending here. A forum for continued discussion on this issue would be very useful if participants could discuss experiences and strategies for overcoming age bias in all levels of academia. I apologize for the long confessional but it felt good to load this past baggage off and face the future with grim bravery about what I can and can’t accomplish. dear readers, thankfully i found this blog tonight. i am heartened by the writing and by the real world stuff that couldn’t possibly exist to the person who thinks housewives and matrons have better things to do. i just made my masters at 50. yeh! after a full run of single parenting, a return to the university to finish my undergrad took two and a half years–a degree i ditched 28 years ago. add three years for masters, working, disabling illness. et voila. i requested to have my graduate degree transcripts separate so i could present them as a stand-alone, a hard fought and won record. powerful people said no. that’s not how “we” do it. why i asked? where’s the policy? don’t you see, academic institution with all the righteous justice bylines and laws, you are promoting ageism (who cares, you have a job). suggestion to photocopy my diploma. what? real jobs, big jobs want transcripts! (i guess i shouldn’t aspire so much). i was given an excerpt from the catalog. fourlinestobeexact. in red. i guess i can’t read. i know the difference between blowoff and policy making. i’m 50! age discrimination is insidious, and ugly. i’ve lost my cool many times. i am a change maker. i read your writing here, and am with you in support every step. tomorrow i’ll say: oh sorry, i am losing my cool-i am on the verge of menopause, you know, it’s something older women “git”. i am proud of my time on earth, where i’ve been, how i have stayed with it when i wanted so desperately to end it, stop, be done. there’s more to come. older women rock! bedrock, granite, deep earth and beauty. Mormont – while age can be a factor, confidence is extremely important. You have to be confident in who you are as you are. It is one thing to dress professionally. That you should do. Keeping yourself healthy is a good idea. Everything else is about how you see yourself more than it is how others see you. If you have confidence within, it will shape how others see you more than anything. Thank you so much for your post. I’ve been struggling with some of the same issues, and am looking for advice wherever I can get it. I am a white male, so the sexism issues don’t apply so much, but I’m quite worried about putting everything on hold for four or five years and finding out it was a big mistake at the end. Walker – I am not in your field, but the advice I always give students is to talk to someone who is doing what you want to do, and find out what route they took and what route their coworkers took. 🙂 They will likely have good insight into the process. Good luck! I wish I would have read this three years ago when I was in incredible pain and feeling a major sense of failure. I am 64. I returned to school at the age of 41. I began at junior college and moved to the art institute and on to an M.A. program and then Ph. D. During my grad program I won every prize offered and started a job (contract assistant professor) before the completion of my doc. I fit well with the faculty and ran a program in West Africa for the University, all with resounding success. The problem, the Dean hated me because I was old. Old white guys have been a problem for me. As a result I was not offered the tt position. I finished my degree and moved to another university where I was hired on my resume for another contract job. Having never seen me they were shocked when I was very lite skinned and older. The Dean had a double problem with me, not black enough and too old. I worked in the department for two years. The second year I applied for the tt job in my subject and was to be interviewed as a finalist. The Dean told the faculty they could not interview me. He held their futures in his hand so they had to comply. He knew the faculty would hire me if they interviewed me. I had tremendous success with the students and we all wanted it to continue, with the exception of the Dean. The faculty did not like the other candidates and so it was suggested they rehire me on contract and the Dean still wouldn’t hear of it. I followed this heartbreak with an NEH post doc and then went back to the same university in a different department to fill in for faculty on sabbatical. I just recently have come to terms with the issue that I have a Ph. D and no job and student loans that I cannot afford to pay. I was so wounded by the situation I couldn’t work on my research. I have just recently returned to my research and am now working on the BOOK. My view at this point is that owe no one anything regarding what I write and so this is kind of freeing. And amazingly I am not bitter but I am disappointed that I could not achieve my goal of a tenure. Thank you ever so much for your informative and enlightening article. I wonder if I could ask you for advice for a situation I am facing which echoes quite a bit of the preceding passages. I am a 37 year old mathematician for the aerospace industry having graduated back in 2001 with outstanding results in pure and applied mathematics, with my highest level of degree being a Masters of Pure Mathematics. Due to my achievements back then I had the opportunity to study for a PhD in mathematics at a prestigious university, however due to my family situation at the time I had to give up that great opportunity in order to immediately seek a paying job. Since then I have not had the chance to return to academia, yet I have held onto the desire to do so. Ever since my graduation I have diligently kept up personal studies to continue advancing my knowledge in the areas pure mathematics and mathematical physics. At this point in my life I have now reached a level of family stability and personal maturity which are conducive to seriously undertaking professional academic research and teaching; to this extent I have been actively looking to move away from industry and back into academia by applying to study for a PhD in mathematics. Regardless of my outstanding past academic achievements, and of the ongoing mathematical research I have performed throughout my industry careers, I have been told by a majority of academics that upon completion of a PhD I would be “too old for any university to hire [me] because [I] would have little chance competing for faculty positions against academics of the same age who continued on into academia from the time when [I] stopped”. Basically, I am having my past lost opportunities rubbed in my face and effectively told to stay where I am. I am beginning to question whether I am being realistic with my desire to seek a career in academic research and teaching given such mentalities of academic staff. I would very much appreciate some informal advice on my situation. I eagerly await your reply. Please read my blog post, “Should You Do a Ph.D.?” In that, my answer is generally speaking, no–especially with regard to your circumstances as you describe them. I can’t say that you would be too old per se; I don’t know how the field of Mathematics works, and new Ph.D.s are often pretty old, and can get first jobs in their 40s. But, aside from outright ageism (and again, Mathematics MAY be a particularlyk ageist field), there is the sheer financial bloodletting that a phd represents,loss of wages and soc security payments, and tiny likelihood of finding a t-t job at the end. everyone avers that age doesn’t count in academia, but reading this blog and seeing experiences like my own multiplied, it has hit me squarely.,,, the truth is that it does, its the reason I get turned down for all chances of employment in the department no matter how small, despite frequently being the best student, and that my research project plans that extend into fieldwork and development are not supported, or even heard. I was hoping this would change when I had a doctorate and I’d suddenly get attention and be taken seriously, but it probably will not. if getting a tutoring post let alone a junior teaching post or tenure, is absolutely out of the picture and the fight to get any employment in the university will be a bloody business it seems, and I don’t like the elitism, snobbery and backstabbing competitiveness in the ivory tower too much as it is….what do others do as alternatives… what is the plan b… where can one find other types of satisfaction…I’m in linguistics and hope to start a project next year doing development work with an endangered local language, recording and archiving oral history, folk tales and specialized linguistic elicitation… and I need the PhD funding just to keep on going, as bread and butter really, because the activism is not going to earn me anything. This is painfully true and, as a single woman, I am experiencing all of these issues. After getting my Ph.D. at 52, there was a decade of adjuncting, unemployment, and food stamps. How did I ever get the foolish idea that having an education would lead to a secure, respected, well-paying job? At this point in my life, I will not live long enough to pay off my school loans. But another quandary is staring me in the face. At 62, I was offered, and accepted a tt position in the social sciences at a SLAC. At the time I was in hog-heaven, knowing a miracle had just occurred. (I have to add here that I got the job only with Karen’s help.) The pay is abysmal but my colleagues are great and the rural location suits me. The down side is that I have been working 70 hour weeks for the last year (5/5 teaching load as well as coordinator of an internship program), I cannot do research, and more than half the students in most classes are receiving grades of D and F. The student mantra is, “D means diploma.” It is most discouraging to work this hard and have to tell students on a daily basis to open their notebooks and put a pen in their hand. Although an avid hiker and skier, I have not made a single friend as there is little time (and no money) to participate in these activities where I might meet people. Caroline questioned opportunities in research and consultancies. Without years of experience in management positions, these are harder to obtain than TT positions. I have read TPII columns that propose, “it’s ok to quit” and, while I realize what a prize this tt job is, I also know this workload and isolation is not how I want to spend the last third of my life. Is it more ludicrous to leave a secure job at my age (with no financial cushion) or more ludicrous to stay in a job that is destroying my soul? Great blog for all potential future PhDs who strive to be in academia. My two cents on this topic based on my experience as a faculty, in late 40s, a female, a brown-skin and faced/facing high level of politics and back-stabbing. Typically in basic and applied sciences, such as biology or physics, a PhD candidate can go for two kinds of positions – a) Independent faculty positions such as TT in universities or research faculty in Institutes plus an adjunct faculty position at universities to allow them to take graduate students; b)Non-independent positions such as research associate/scientific associate. In the field of both physics and biology, becoming a research/scientific associate is a viable option for most of the age groups and gender, though not on a permanent basis since their pay depends on the faculty’s grant money. However, for independent faculty positions, it is best to find your first position before mid-late 30s and make sure to get a grant before your 3rd year followed by decent publications. Becoming a faculty in 40s is risky. Most of the granting agencies will not fund the candidate though age cannot be cited as the reason. This is where the situation gets tricky within the University/Institute when the candidate is up for promotion and the candidate will approach mid 40s-late 40s. In most situations, the weights for candidates will be given in the order of how much grants money is brought in, how politically correct the faculty is within the system, age, race followed by gender. While publications are the bread and butter for academicians, unfortunately, that is not the only thing; Managing the entire show and learning to walk a thin political line is the key to success in academia. I am 53 and just received my Doctor of Education degree in December of 2013. I definitely have sensed age discrimination when searching and applying for professor positions. I am a Visual Arts and AP Art History teacher. Luckily, I teach in a private high school and I really enjoy my job. There are two other teachers who have PhDs at my school. I have checked the salaries listed on my state (FL) university system website and I actually make more than an Assistant Professor. I have been teaching (in public and private) for 20 years. I suggest teaching in K-8 or high school as an option-there is no writing/publishing, no committee work, and the kids really love and appreciate you. Aside from wanting to get a professor position, getting my doctorate was a life-long aspiration and I have grown and learned so much through the process. I have many ideas and plans to pursue (such as work on my own artwork every night instead of writing 🙂 now that I am finished. After reading this blog, which only confirms what I was thinking already, I most likely will stay at my current high school teaching position until I retire in 10 years. Thank you, Karen, your blog on this and many other topics is very useful and inspiring! I am 61 and although I had a temporary, 3-year gig full-time at a university (finished my PhD during that time), I’m now on a post-doc, after a hellish year and a half unemployment. My story is too long to go into here, but summary is although I tried grad school in the early 80’s, was forced to leave for various reasons including the necessity to provide for a young family. I have a publication record going back to 1982, and published three more as an independent scholar before returning to grad school. All those are well-cited and generally considered authoritative, as far as I can tell. Last year I published a book that scholars in the field have praised. My scholarly colleagues seem to respect me and my work. I have been applying for jobs before and after my PhD in May 2011. I’ve tried to avoid ascribing lack of success to age discrimination, but by now it seems obvious. In 1999 when I first considered returning to grad school, I was told explicitly by a respected scholar at an Ivy League school that I would not be considered because of my age. At the school where I got my PhD, I was explicitly told that I would not be considered for an opening there because of my age. Yes, I understand the humanities have taken a huge hit because of the Great Recession (see recent NYT article on this). What disturbs me the most is the knowledge that hiring committees not only routinely violate an admittedly almost unenforceable law, but feel utterly justified in so doing. Age discrimination in academic hiring, especially, especially because of the justifying rationalizations, are to my mind just one more indication of how American academia has become corrupted. Whether it was wise for me to return to grad school in my 50s is beside the point. I think I’ve demonstrated my ability to work at an “Olympian” level, and have demonstrated competence as a good teacher. So the result for me, as I’m sure is true for many others in my position, is a disinclination verging on loathing to even try to get into a profession that has come to accept as a norm the violation of the law. Just to say that I had an academic post in the second year of my PhD (a more receptive area THEN) and I gave it up before I finished my PhD. It’s not that lovely being bullied AND not having the time to complete the thesis that defines you as an academic. Now, I am open to all work offers at age of 49. I don’t think academia is just ageist. I just think that the party’s over. Whoops, an assumption on my part. Ageism is not sexism. Sorry Philip. Yes, you do seem to me to be “blaming the victim,” as well as indulging in what I’d term “exculpatory generalization.” An unstated, even if not believed, implication in your critique is that those older academics who “get with the program” will, unlike their already “fully-formed” colleagues who “don’t get it,” be successful. This is flat-out false. You need to stop making excuses for what is illegal. I’ve heard all the excuses, many from academics who consider themselves “liberal,” justifying why they won’t consider hiring an older candidate. The last thing we need is one more excuse. Hi, Karen! Thank you for this most informative blog. I am 58, and considering applying to PhD programs in a very high-needs area–Vision Rehabilitation Studies. Ii have growing concerns regarding age descrimination, but additionally, I am visually impaired, and have faced hiring discrimination in my previous fid of Special Education; though I hold an MA Ed, and now a MA in Vision Rehabilitation. I find it difficult to access mentors and advisors to discuss options, ask questions and bounce ideas off of. I began doctoral studies in my late 30’s, single parenting an infant snd two teens, working on both master’s and doc coursework, living on my TA stipend. Finances became crushing with daycare, etc., and I took a full time job offer as soon ss I completed my comps. I have always wished to continue, focusing on research in warly literacy and assistive technology impacts. But again, I am asking the same questions your other readers are asking, and I have nowhere near the stellar performance CV’s that many of these individuals have!! However I am passionate about disability independence, with literacy and access as top proorities. What are your thoughts? And thank you! Do not enter a Ph.D. program if you don’t have funding to pay for it in full while also having your retirement fully funded. The financial risks, at the age of 58, are in my view far too great. I got my MFA in a creative field at 53, and was of course the oldest student, in a class of 30 year olds. I was called “Mom” a few times by a professor my age, as a putdown, a way to try and shut me up. I have found that the job market is crippling for an older woman, especially if you are changing fields, and find yourself competing against much younger candidates. It is as though I am invisible. Ironically, at my current (non-academic) job, where I work with people in their 20’s, I am the most tech-savvy, yet the tech questions keep getting directed to the others. And I have way, WAY more energy than the young people I work with who tire SO easily, like they have never done a real day’s work; I can work rings around these kids. So the age discrimination is a real: I am assumed to be unable to do things I am quite capable of and have demonstrated, and the young people are assumed to have knowledge, skills, and even energy, that they don’t have. I am in music. Finished my DMA at 46, and have experienced exactly what you describe. I have a question in reference to your discussion on leaving dates off your resume. I graduated with a science-related degree 20 years ago. I’m 39 years old and I retook Basic Bio and General Chemistry last semester in anticipation of applying for a nursing or PA program. After having a taste of academia, I want to continue on a M.S. and/or Ph.D track in Biomedical Sciences. I had grumbled about having to retake classes, but then was shocked at how much we have advanced in biology over the past 20 years. These programs SHOULD require students to retake their science classes if those classes are more than 5-10 years old. It is understandable that a graduating date of 1997 for a B.S. indicates that the student is not up-to-date in the sciences. I would never had realized that the freshman biology class would be so in-depth and advanced unless I had recently taken that class. My question is this: would it be beneficial to complete a second B.S. now prior to pursuing an M.S. and/or Ph.D in Biomedical Sciences? I would then have an up-to-date B.S. degree. It would probably add an additional 1.5-2.5 years to my studies. However, maybe that extra time would be worth it if it pays off in the job market later? I am 47 and left grad school in my twenties all but dissertation. I am now going back to finish, with a slightly different degree due to program changes. I am just finishing my first semester and work full time at the university I am getting my degree at. I think the skills I have learned as a professional have taught me attention to detail and completing things beforehand, which makes me a better student than when I was younger. I am courted by faculty tomdomresearch with them because of my extensive experience and they have let me know they would like me to stay once I finish. That being said, I have no delusions about becoming a full professor or even advancing my 100k salary once I finish – I just see this as personal growth and finishing something I started and regret not completing. I can relate. I went back for my Ph.D. in my late 40s and entered the job market in my early 50s. Frankly, I can’t figure out why I was hired. Ageism reared its ugly head during my very first week when the newly hired Assoc Dean of Research met me for the first time. She immediately decided that I was simply biding my time until my retirement and frequently referred to me as “seasoned”. I reminded her that I had the same qualifications as the other junior faculty. She couldn’t get past her bias. I was left out of junior faculty meetings, not suggested for key committee positions, etc. Worse yet, the Dean assigned her as my mentor. Her interpretation of mentoring is saying, “You know where to find me.” Meanwhile, the younger junior faculty, with the same qualifications as I, are doted upon. Tough luck for me. When I read Karen’s initial post, I thought she was pushing a stereotypical view of older Phd applicants and their expectations. I thought as a financially secure older applicant (age 49)with no desire to work in academia that I would not face the difficulties described here. That has not been the case however. My field is public health and during interviews with professors at different universities recently, I experienced no overt ageism but did note quite a bit of coded language regarding my age and gender: at all three schools: one ivy, one private and public, I was told I had an “unusual” background. At all three schools, they asked if I had “competing responsibilities” that might affect my ability to work at the level required. I was also told that the practice doctorate DrPH was better than a Phd for me. Frankly, I’ve decided that doing a doctorate in the UK is a much better fit for the older applicant. The Phd is only 3-4 years long,part-time study is common, no tedious coursework required and best yet, no GRE. You can work part-time on a student visa and you are eligible for federal loans at many institutions. Tuition costs are low even for international students. I wonder if the stultifying academic culture that Karen describes is uniquely American. This all sounds very illegal. How are more lawsuits not brought against these institutions? I agree about the illegality of this. Having gone back to school at age 50 to get my PhD, and 8 years later am successful in many ways (i.e., lots of pubs, known in the field, national invited talks, and a book contract), I seem unable to land a tenure track position. At this point, I’m not sure it makes sense for me, although the stability would be nice. Can’t help wondering if ageism has something to do with it. From how you describe your situation it sounds like you have been out of the workforce for several years and maybe not looking to work full-time due to your family obligations? In that case, I would recommend working for yourself in order to maintain your self-esteem. Part-time work is rarely part-time and full-time work is always more than 40 hours a week. Unless you have excellent household help, it can get pretty stressful, pretty fast, especially if your career is treated as subordinate to your spouse’s career within the family. Years ago I hired a return-to-work mother with a Phd who found the lack of flexibility in the workplace unmanageable as she still had primary responsibilities in the home. Rather than give up she chose to be an free-lance evaluator of programs in my field and was able to take a series of short term government contracts that resulted in a formal written product that she was able to include on her resume. Her spouse left at some point and she needed to work but she was able to turn her work as a consultant into a regular 9-5 gig with an NGO she knew through her previous evaluation work. It’s all about your network. My (then-)friends & I always used the language of the “cult,” too, for better or worse: when we first made the connection, we joked that hey, cults can be great! You have all of these people around who are desperate to encourage you to believe––so that they might better support their *own* belief––in the Meaning, the message, the higher calling. This totally encourages Stockholm Syndrome, yes, & is one of the driving forces of that endless refrain of “just one more year” on the market––but it also means peers providing a strong support system (and company through the misery). Those studies on friendships being best cultivated given “proximity; repeated, unplanned interactions; and a setting that encourages people to let their guard down and confide in each other”? For younger grad students, grad school is nearly always that environment: we see each other in the grad lounge, in the writing center, pass one another in hallways, work our way through grueling seminars––& often, then, decide to grab an impromptu drink. Soon enough you’re besties or roommates or going on vacations(!) together. So yes, you’re almost certainly screwed if you’re in your 50s when you first dive into the shark tank of the job market, & that’s for the many reasons elaborated above––but I think the question of *who finishes the PhD in the first place* isn’t just the constraints of the ceiling: it’s also the instability of the floor.